Trees. In your yard and street. In your suburb and local parks. Trees matter! 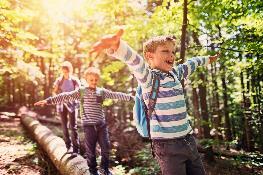 In this free 25 minute presentation for parents with children in school/pre-school, we look at the importance of getting out into the bush – good for children and adults. We sing the praises of trees, and we consider the social, educational, mental and physical benefits of being in nature. Conducted in conjunction with Sutherland Shire Council, these workshops are suitable for primary schools and preschools. If you would like to encourage a presentation at your school, download the flyer and take it along to your next committee meeting. To find somewhere to enjoy nature with your children, check out our map. Share your favourite family walk and we will add it to our map.